We’ve been a bit quiet on social media while being very busy behind the scenes. 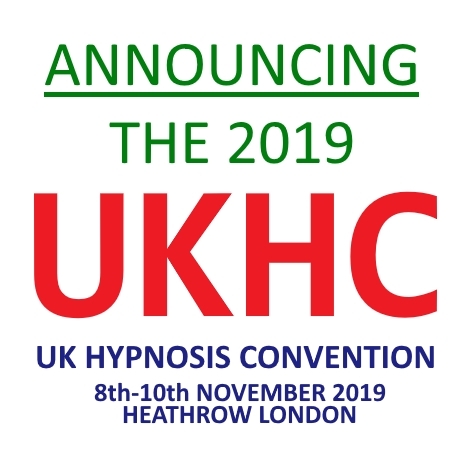 We are delighted to announce that we have confirmed the dates for the 2019 UK Hypnosis Convention! The 3 days of the convention will be November 8-10 (Friday the 8th to Sunday the 10th), with pre and post convention workshops either side making it a full blown 7-11 event. We’ll be returning to the Renaissance Hotel in Heathrow. Much of the format will be the same, but we have plenty of freshness to enliven your senses that we’ll be announcing in coming weeks. Our next announcement will happen in the next couple of weeks to let you know when the speaker applications are open. We’ve had a couple of people apply to speak at the 2019 event using the 2018 forms and those people will need to submit a new application. Please do not apply to be a speaker for the 2019 event until we announce it here. In coming weeks we’ll also have early bird tickets going on sale too. Adam and the UKHC Team.